Wrap-E-Soothe Suit - an easier wet wrap treatment for child eczema sufferers. 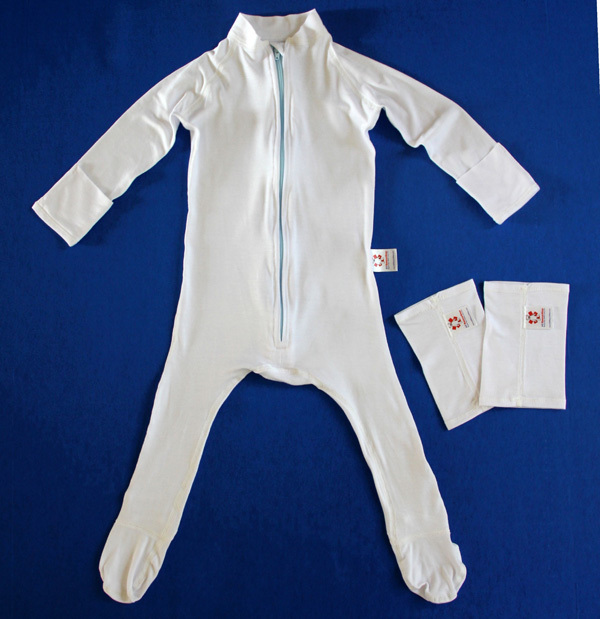 Wrap-E-Soothe Suit – an easier wet wrap treatment for child eczema sufferers. Those familiar with the technique of wet wrapping children suffering severe eczema will know how difficult it can be and the time it takes to wrangle a wriggly child while wrapping their limbs in wet bandages. Here is a much simpler solution! AD RescueWear have created the ingenious Wrap-E-Soothe Suit in sizes to fit children six months to three years and priced US$59.95. Also available, Wrap-E-Soothe Sleeves (US$22) and Treatment Gloves (US$8), all designed to make eczema treatment a little easier. My own six-year-old is a chronic eczema sufferer and we use tubular bandages which are difficult to prevent rolling down behind knees and certainly don’t cater for feet and hands. My only wish is for the Wrap-E-Soothe Suit to come in larger sizes! AD RescueWear’s Wrap-E-Soothe range is designed to be a snug fit by sitting against the skin and is made from Tencel fabric which has excellent water retention properties and maintains its stretch and shape when wet. Shipping is available to Australia. For those who don’t require wet wrapping but are looking for an allergy friendly sleepwear solution be sure to take a look at our Bamboo Bubby Bag post!